Powers/Abilities: Phoebe possesses no superhuman powers, but she is a shrewd and talented business woman accustomed to ruling a multi-billion dollar company. History: (Namor I#14 (fb) - BTS) - Phoebe Marrs grew up with her twin, Desmond, in the shadow of their father, Archimedes Marrs. Archimedes headed Marrs Corp., a struggling corporation, and Phoebe longed for a simple, quiet life. At age 19, she ran away to the midwest and met Michael Payne. They fell in love and married, and Phoebe spent the next 18 months as a happy housewife. When Michael's business collapsed, he began to struggle with feeling useless. Desmond showed up and offered Mike a million dollars to divorce Phoebe, and he did. Phoebe later realized that Desmond's hand had been in Michael's business failings as well. Three months later, Phoebe found out she was pregnant and took a world cruise after Desmond ordered Phoebe to have an abortion. After Edward was born in Singapore, she had him secretly brought back to the states and found a house in Connecticut where new employees Sumner and Miss Wickham could raise him in secret. Phoebe was horrified to learn that Edward suffered from a mental retardation, looking at the world each day with no memory of the previous day. Despite all this, she was able to keep her son a secret from Desmond and the media. (Namor I#9 (fb) - BTS) - After their father died, the Marrs twins struggled to balance their inheritance. They sought out the financial aid of Headhunter, a business woman who required her clients to sign a contract that would allow her to collect their 'head' years later. She would 'collect' by attaching her client to a life-support rig and making it look as though their head was mounted on her wall while keeping them hypnotized. Desmond and Phoebe signed away, never thinking Headhunter would actually collect. (Namor I#1 (fb) - BTS) - One of the many businesses the Marrs twins fought against was Parallel Conglomerate, a company they reduced to an inconsequential size. (Iron Man I#265 (fb) - BTS) - The Marrs twins were at odds with Tony Stark of Stark Enterprises as they fought over corporate holdings. Stark beat the Marrs in buying out a company called Centrex, causing Desmond to retain a hatred for Stark. (Namor I#5 (fb) - BTS) - At some point, the eco-terrorists FORCE attacked some of Marrs Corp's holdings. (Iron Man I#260 (fb) - BTS) - Seeking revenge on Tony Stark, Kearson Dewitt approached Desmond and Phoebe with the plan to take Stark down. Dewitt designed a chip that would be implanted in Stark's spine that would allow the paralyzed Stark to walk again but that would, in time, give Dewitt direct control over Stark's nervous system. The Marrs twins agreed to fund the project. (Namor I#1) - Phoebe returned from a business trip in Hong Kong and grew angry with employees Gerrold and Maitland. She went to Desmond's apartment and Bevis, the butler, directed Phoebe to Desmond's location in the gun room. She found Desmond ready to shoot himself, and deflected the gun just in time. She renewed Desmond's interest in life by turning him on to the challenge of ferreting out the mystery man behind the new Oracle, Incorporated, a company which had bought out Parallel Conglomerate. (Namor I#2 (fb)) - Desmond enlisted the Griffin to kidnap Carrie Alexander, public spokesman for Oracle, Inc., in order to draw out Oracle's true head. (Namor I#2) - Desmond and Phoebe, while monitoring the Griffin, were shocked to see Namor, who'd they believed dead, come out to rescue Carrie. Phoebe reflected on Desmond's new zest for life with this new challenge. (Namor I#3) - Desmond and Phoebe noted Headhunter's helicopter watching the battle, and Namor soon defeated the Griffin. After watching Namor talk to Carrie Alexander in the hospital, Desmond developed the idea of having Phoebe seduce Namor to get Namor under their wing. 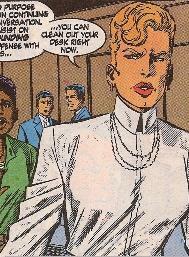 (Namor I#4) - Phoebe dressed to attend an Oracle celebration party with Desmond. When she expressed concern that Namor may be too mighty a foe for them, Desmond slapped Phoebe to silence her. Phoebe returned to her desk and promptly fired Margaret for making a mistake. After Desmond completed a merger, they got to the party fashionably late, and Phoebe felt mummified in her gown. Desmond let Phoebe know that he had a special surprise planned for the party, but wouldn't tell Phoebe what it was. Desmond sent Phoebe to find Namor, but couldn't before the tanker came into view and then exploded. (Namor I#5) - After returning home (Desmond had ditched her at the party), Phoebe learned that Desmond had financially backed F.O.R.C.E. to attack the supertanker. F.O.R.C.E. ignited the oil, as promised, but Namor was able to stop it from destroying the city. (Namor I#6) - As Desmond watched Namor's struggles on the courthouse steps from a nearby roof, he challenged Phoebe for not snaring Namor already. In an attempt to get the two to meet, Desmond pushed Phoebe off the roof, leaving Namor to catch her. After Namor did so, Phoebe kissed him in gratitude. Namor returned Phoebe to her home and she slipped into a bathrobe. Phoebe charmed Namor briefly, then received notice of Sluj, an ecological disaster, attacking a Marrs ship, the Sea Queen. (Namor I#7) - When Desmond learned that Namor had gone off to investigate the Sea Queen, he was furious. He grabbed Phoebe as if to hurt her, and was shocked when Headhunter came in stating that it was time to collect. (Namor I#8) - After Namor defeated Sluj, Phoebe rushed to him, asking for help against Headhunter. In the back of her limo, she confided in Namor, then kissed him. At Headhunter's building, Namor moved to carry Phoebe to the building's top by flying, having forgotten that he'd lost his ankle wings in the battle with Sluj. They took the elevator, Phoebe sensed a power and a vulnerability in Namor that she admired. Phoebe and Namor confronted Headhunter, demanding Desmond's return, and Phoebe wondered if another arrangement could be made (offering Namor as a trade for Desmond), but Headhunter informed them it was too late as Desmond was already mounted on her wall. (Namor I#9) - Headhunter tried to hypnotize Namor, though he faked it, and she mounted him on her wall as well. Later, after Namor had defeated Headhunter and Desmond had been freed, Phoebe watched the news about Headhunter's defeat. Namor went to Marrs Corp. to confront Phoebe on her betrayal, and Desmond acted shocked and appalled at Phoebe's behavior in front of Namor. Namor left thinking Phoebe cold and ruthless and Desmond full of honor. (Namor I#10) - Phoebe grew frustrated with Desmond's laughing over Namor's folly. She began to realize that perhaps she really did love Namor. (Namor Annual I#1/4) - Phoebe attended a birthday party for Namor alongside several of Namor's friends and allies. (Iron Man I#260) - Desmond and Phoebe went to check on Dewitt in the Stark project. When they arrived, Dewitt was noting how Stark seemed to be exerting a high amount of physical activity (as Iron Man, though they did not know this). Desmond, hoping Stark would be injured, demanded that they take control of Stark's nervous system at that moment. (Iron Man I#261) - After Desmond learned that Stark was successfully being controlled, he reasserted his power over Dewitt, reminding him who was in charge (at one time bending Phoebe's wrist to get her to stand away). After Phoebe reminded Desmond what a worthy opponent Stark was, Desmond agreed to let Kearson continue running the project and departed. Kearson tried to flirt with Phoebe, but she denied his advance and left. (Namor I#13) - During Namor's trial, Phoebe went to the courthouse during a recess and asked Namor to give her a chance to explain herself after his trial was complete. (Iron Man I#265 - BTS) - Stark pieced together the Marrs' involvement with the plot against him. (Iron Man I#266 - BTS) - Stark defeated Dewitt. (Namor I#14) - Phoebe attended a meeting where she heard that Stark Enterprises was launching a corporate attack on Marrs Corps in retaliation. She admonished her employees to find a solution. Her fury was replaced by pleasure when she saw that Namor had come as she'd asked. Phoebe fired Allison for muttering something, and grew defensive when Namor asked her about the firing. Softening, she convinced Namor to fly with her to Connecticut. When Sumner greeted Phoebe as Mrs. Payne, Namor was confused, but Phoebe was pleased to hear that Edward had been demonstrating conscious action in his play. Edward, of course, did not recognize Phoebe when she greeted him. Phoebe took Namor and Edward into the backyard and sadly explained her history to Namor before the Griffin attacked them. Phoebe watched Namor battle and tame the creature. She told Namor that he had tamed her as well, and that she was in love with him, before giving him a kiss. (Namor I#15) - When Namor approached Desmond and asked Desmond to watch over Oracle, Inc. while Namor was on an extended leave in Atlantis, Phoebe told Namor she was coming with him. After Namor stated that this was a personal trip, Phoebe asked what could be too personal since they loved each other. Namor left anyway, and Phoebe confessed to Desmond that she really loved Namor and that she wouldn't allow Desmond to harm Namor. Desmond struck her in a rage, revealing that he knew about their trip to Connecticut. (Namor I#16) - Phoebe arranged transport to the sky over Atlantis, determined to follow Namor there. She flew to Antarctica, where she found Namorita and Carrie Alexander waiting for Namor, who was investigating a mystery in the Savage Land. After entering the Savage Land, Phoebe was too hot and removed most of her clothing, ignoring Namorita's admonitions to stay clothed until a giant bug attacked her. Namorita moved to lead them to Namor. (Namor I#17) - After Namor, Namorita, and Carrie were caged by the Super-Skrull (disguised as Iron Fist), Phoebe was taken into a shelter by the Skrull's ally, Ward Meachum. Meachum considered he and Phoebe equals and desired her company as he made a bid for global power. When Phoebe denied him, he moved to strike her but stopped himself. As Meachum again prepared to strike Phoebe, Misty Knight stopped him, and Meachum revealed their plans for the world to be destroyed. "Iron Fist" entered and revealed himself as the Super-Skrull. (Namor I#18) - The Super-Skrull postured, and thwarted Misty's attempt to stop him. After the Skrull left, Phoebe checked on Misty, then they listened to Ward explain his alliance to the Skrull, how they would destroy the planet, and how Ward would get his own planet to rule and the most beautiful woman in the galaxy as his reward. Phoebe ridiculed the man, pointing out to him that a Skrull's idea of a beautiful woman may not be Ward's ideal. This seed planted, Ward turned on the Super-Skrull, who was soon defeated with the help of Shanna the She-Devil and the Griffin. (Namor I#19) - Back on the ship, Phoebe was surprised to learn that Desmond had attacked and beaten Caleb Alexander, and claimed that it must have been self-defense, making Carrie very angry. Namor and Namorita returned to Atlantis, sending the rest of their allies back to New York. (Namor I#20) - Returning to New York, Phoebe found out that Desmond had committed suicide when the Punisher had threatened to kill him for his crimes. She went to the morgue to see the body, where she laughed and danced around the corpse, utterly relieved to finally be free from the Marrs influence. When she returned to the car, Jenkins tried to warn her that the Punisher was waiting inside. The Punisher ordered her to enter, saying they had things to talk about. (Namor I#21) - Having left the Punisher under unknown circumstances (perhaps he was only determining she was innocent), Phoebe took time to reassess Marrs Corp standings, and realized that her business was almost bankrupt due to Stark's influence and Desmond's mistakes. She went to Namor, who consoled her on Desmond's death, and begged for his help. He agreed, saying that begging wasn't necessary. (Namor I#23) - Namor appointed Jacqueline Crichton (the former Spitfire) to head Oracle in his absence. When Jacqueline determined to have the rest of Marrs Corp. absorbed into Oracle's holdings, Phoebe argued that that isn't what Namor had promised her. Furious, she tried to attack Jacqueline, but was stymied. Jacqueline sent her away. Phoebe muttered to herself that she needed Desmond to run Marrs Corp. and was shocked when a door opened and she thought she saw his form. She rushed into the next room to find it empty. (The 'ghost' of Desmond was secretly Llyra). (Namor I#26) - After six months, during which an amnesiac Namor had gone missing, Oracle was turned over to Namorita. Phoebe continually confronted Namorita on the state of Marrs Corps as a wholly-owned subsidiary, but Namorita refused to refute Jacqueline's decision and let Phoebe know she was now an Oracle employee. Phoebe bumped into her former employee Allison on the way out. As Phoebe rode the elevator, she reflected on her future without Desmond when the elevator opened and Desmond appeared, wondering how Phoebe could let them stomp on the Marrs name like she had. (Namor I#30 - BTS) - Posing as Phoebe, Llyra entered Oracle headquarters to obtain some "merger files," and was briefly detained by a security guard. (Namor I#31 - BTS) - Again posing as Phoebe, Llyra seduced Jim Hammond (the original Human Torch, now non-powered head of Oracle security) in order to gain a stronger hold on Oracle. Hammond briefly mistook her for Desmond. (Namor I#34 (fb) - BTS) - When Phoebe saw an opening in Oracle's business structure, she jumped on it and bought out the Oracle building, becoming its sole owner. (Namor I#34) - Phoebe approached Namor and ordered he and his allies off her property. Namorita and Iron Fist told Namor that they would sort this all out. (Namor I#47 - BTS) - Llyra, posing as Phoebe, traveled to Oracle's west coast headquarters and seduced Leon McKenzie. Phoebe had developed a reputation as being slightly crazed due to seeing her brother's ghost. (Namor I#49) - Phoebe went to Oracle for a surprise meeting of the board of directors, angry at Namor for calling it unexpectedly. She fired Maitland on her way in, and was shocked to see Desmond again, sitting at her desk. Desmond instructed Phoebe to ensure that Namor stayed at Oracle overnight. Phoebe spent time contacting Oracle's employees and major shareholders to get them on her side in her bid to control the company. At the board meeting, Phoebe chided Mr. Losey for Namor being late. They argued that her stock certificates weren't valid and she revealed the loyalties Oracle had to her. Namor said he needed time to think things over. (New Warriors I#57) - Phoebe took a call from Justice of the New Warriors requesting to get in touch with Namor regarding bad news about Namorita. Phoebe advised Justice that Namor had not been very pleasant recently. (Namor I#50) - At the next meeting's board meeting, Namor agreed to let Phoebe handle the company matters as long as she did not harm the environment. Phoebe revealed that Oracle's west coast head (Leonard McKenzie) had embezzled funds from Oracle, Inc. in order to fund a mission to retrieve a sunken wreckage in the Antarctic. She asked Namor to investigate, though he said it would have to wait because he had a date. Namor stripped to his trunks and asked Phoebe to press his suit for him. Later, while working with Hammond, Namor burst in and demanded to see Desmond's ghost. Phoebe led him to the office where, when confronted, "Desmond" turned into Phoebe, shocking her. Hammond was surprised as well, realizing that he hadn't been romantically involved with the real Phoebe. Namor tossed"'Phoebe" across the room, and she revealed herself to be Llyra. Soon the Fantastic Four (Human Torch, Invisible Woman, Lyja, Thing) arrived and battled Llyra. (Namor I#52) - Phoebe recovered information about Leon McKenzie's mission to the South Pole using Oracle's embezzled funds, and sent a team to investigate. When Namor returned to Oracle, Phoebe met Andromeda, thanked Namor for clearing up the ghost mystery, and gave him the new information. (Namor I#54) - When Namor returned from the Endurance mystery with the Antarctic Vibranium, Namor accused Phoebe of being involved before realizing it must have been Llyra again. Phoebe arranged a buyer in Jack Gamelin of Roxxon for the Vibranium mound, knowing that Namor would soon discover that Roxxon was now involved in Hydropolis's (Namor's new underwater city) construction. (Namor I#56) - Phoebe Marrs visited Leon in jail, demanding to know why he had implicated her in his plots. Before he was returned to his cell (due to Phoebe growing agitated), she realized that his last name was McKenzie, and that he must be a relative of Namor's. She rushed off to research this, then moved to give Namor the news. When Namor was implicated in an attack by the surface world, Phoebe picked him up in her Ferrari and sped off. (Namor I#57) - Namor grabbed Phoebe and flew off, leaving her car to be investigated by Jerry and other cops. Phoebe shared with Namor her proof that Leon was Namor's relative, a grandson of Namor's father, and how Llyra used that relation to help Llyron gain the throne of Atlantis. Namor took Phoebe to Hydro-base, where they donned uniforms and were lowered to Hydropolis. Phoebe was impressed with the city, but was disgusted to see Carrie Alexander there. Phoebe watched as Lt. Langstrom, Roberts, and Captain America tried to arrest Namor. After a brief battle, Namor escaped. anything to do with the planet Mars. (Namor I#1) - An employee of Marrs Corporation, Gerrold greeted Phoebe as she returned from a business trip in Hong Kong. Phoebe was short-tempered with Gerrold. (Namor I#1) - An employee of Marrs Corporation, Maitland greeted Phoebe when she returned from a business trip to Hong Kong, but Phoebe grew angry with Maitland. (Namor I#49) - Now working with Oracle, Inc., Maitland bumped into Phoebe in the hall and was then fired for leering. (Namor I#1 - BTS) - Phoebe asked Margaret to bring her all the company's recent acquisition papers. (Namor I#4) - After spending three days compiling figures for Phoebe, Margaret nervously approached her boss with the results. Phoebe grew enraged at Margaret for leaving out some figures that Phoebe had approved being left out. Not to be dissuaded, Phoebe fired Margaret. (Namor I#14) - Allison was an employee who worked for Phoebe Marrs. When Namor came to visit, Allison muttered under her breath about Phoebe's good fortune in knowing Namor. When Phoebe overheard, Allison pretended she hadn't muttered anything and was fired for her lie. Allison wondered how she would be able to support her two children now. (Namor I#26) - After Marrs Corp was bought out by Oracle, Inc., Allison was rehired and worked for Namorita. When Phoebe bumped into her, Phoebe proclaimed how Allison would have been fired for that offense, and Allison remembered actually being fired by Phoebe. (Namor I#14 (fb)) - Phoebe Marrs, using her married name of Payne, hired Sumner and a Miss Wickham to watch over Phoebe's mentally challenged son, Edward, and set them up in a house in Connecticut. (Namor I#14) - When Phoebe returned with Namor to Connecticut, Sumner greeted them and showed them back to where Edward was playing. (Namor I#14 (fb)) - Born in Singapore, Edward was sent back to the states and lived in Connecticut with his caretakers, Sumner and Miss Wickham. Edward suffered from a form of mental retardation, having no memory of the day before as he started each new day. His mother, Phoebe Marrs Payne, visited frequently, but he never recognized her. Edward never knew his father. (Namor I#14) - When Phoebe visited with Namor, Edward paid them no attention and continued playing with his superhero action figures. Edward was shocked when the Griffin attacked, and Namor tamed the beast. (Namor I#14 (fb)) - Michael Payne met Phoebe Marrs in the Midwest and the two married happily. He opened his own store, but was disheartened when his store was foreclosed 18 months later. He began to struggle in his marriage, and when Desmond Marrs offered him a million dollars to divorce Phoebe, Mike did so. He never discovered that Phoebe bore his child and named him Edward. (Namor I#14 (fb) - BTS) - Archimedes Marrs was the head of the struggling Marrs Corporation, which he was able to turn into a multi-billion dollar conglomerate. The father of twins Desmond and Phoebe Marrs, Archimedes was known for being shrewd and ruthless. (Namor I#9 (fb) BTS) - Archimedes passed away, leaving his company to his twins. (Namor I#20) - Jenkins drove Phoebe Marrs to the morgue and, when she returned to the limo, tried to warn her that the Punisher was waiting for her in the car. (Namor I#49) - Attending a meeting of the board of directors at Oracle, Inc., Mr. Losey represented Namor in showing that the stock certificates that gave Phoebe Marrs standing in the company were not valid. Namor and Namorita arrived at the meeting late, and Phoebe revealed that Oracle's employees and stock holders wanted her to be able to make business decisions. Namor needed time to think it over. (Namor I#50) - At the next morning's board meeting, Namor conceded to let Phoebe run the company. Phoebe revealed a plot by someone in Oracle embezzling funds for a project and asked Namor to investigate, but Namor stripped to his trunks and flew out the window for a date. 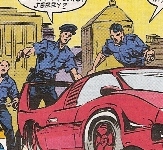 (Namor I#57) - Jerry was one of the cops who investigated Phoebe's car, which was left in the middle of the road empty. Jerry recognized the license plates.